Delays emerged last year without any notice. Well, I reviewed their debut single, "Nearer Than Heaven", for In Music We Trust, but the lack of attention they received in 2003 was remarkable compared to the stir they caused in the press and with the public this year. From the town of Southampton, just south of London, Delays have perfected a pop sound that is heavenly and crystalline. Combining wistful pop from the 60s with a guilty indulgence for 80s and 90s shoegazing, this combo has tapped into a formula that many have tried and failed with repeatedly (ie. Lilys). 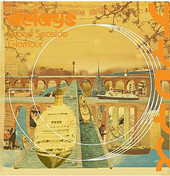 Faded Seaside Glamour is a lush album that is polished to a shine that causes blindness. Singles "Long Time Coming", "Nearer Than Heaven" and "Hey Girl" are all solid examples of the true craftsman that singer/songwriter Greg Gilbert really is, keeping a steady flow of catchy choruses akin to their obvious heroes The La's. Most strange is their fascination with the layered sublimity of the Cocteau Twins, for "Wanderlust" (a shining moment that triumphs with steel drums and all) is textbook Robin Guthrie. There isn't a moment here that doesn't breathe warm and breezy melodies, however, it isn't a flawless record. "Stay Where You Are" suffers from an electric bass that is too synthetically funky and "There's Water Here" is a faltering ballad that's worthy of B-side status, at best. As a debut, Delays have fared well. There are some kinks to work out, but if they stick with the style of songwriting that has found them in the Top 20, they should find a comfortable home at the top.